Margaret Sanger and Charlotte Perkins Gilman and John Dewey, oh my! The Supreme Court’s Burwell v. Hobby Lobby decision of late June returned birth control to the center of the national conversation. One might have thought that unnecessary this far into the twenty-first century; one would have been wrong. 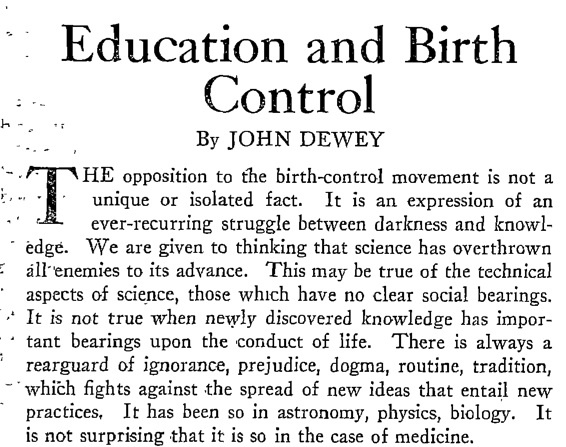 A depressingly relevant—if fascinating—exercise it is, then, to revisit a special issue about birth control The Nation published on January 27, 1932, featuring contributions from some of the most authoritative writers on the subject, at that time and ever. Much of the material in the issue is surprising. Some of it is downright shocking. 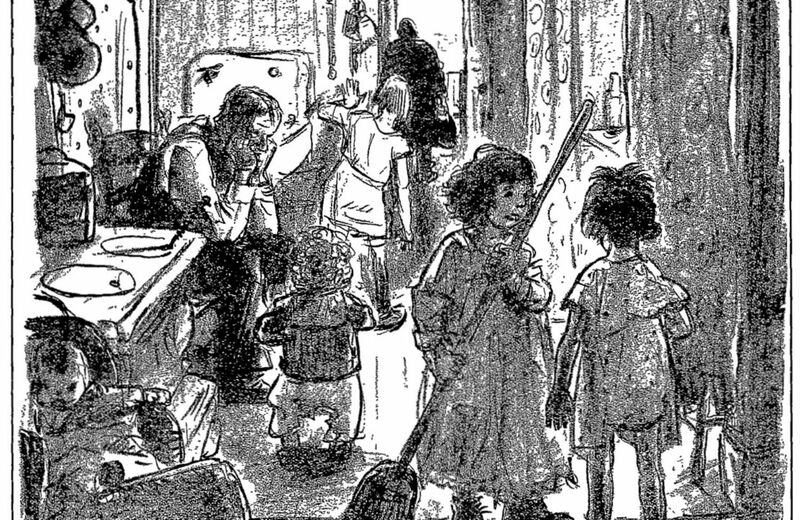 An introductory editorial—presumably written by then–managing editor Freda Kirchwey—cited “the overshadowing importance of the question at this grave juncture of the world’s economic history.” In the midst of the Depression, when so many had so little to eat, birth control was treated as an economic issue as much as it was a social one. That last phrase is sure to set off alarm bells in the minds of progressives in 2014. As well it should. 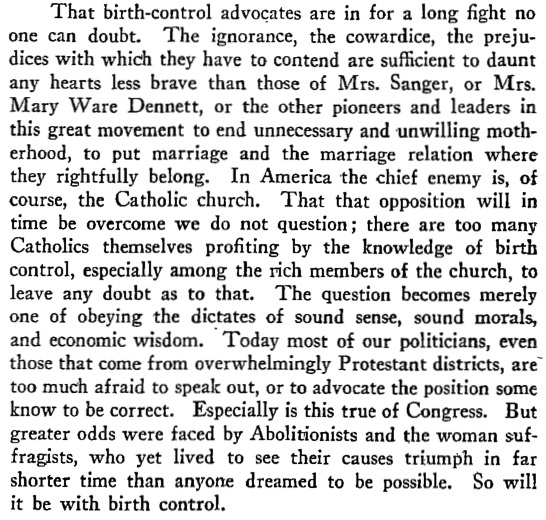 One of the more uncomfortable aspects about the rise of the birth control movement in the United States is its intimate connection to the concurrent rise of eugenicism: each saw the other as an instrument for its own ends. Arguments for the scientific pruning of the population served as arguments for the technology which could, with relative humanity, get the job done. But it is easily and somewhat conveniently forgotten that these were not two movements partnered together for strategic or political purposes. 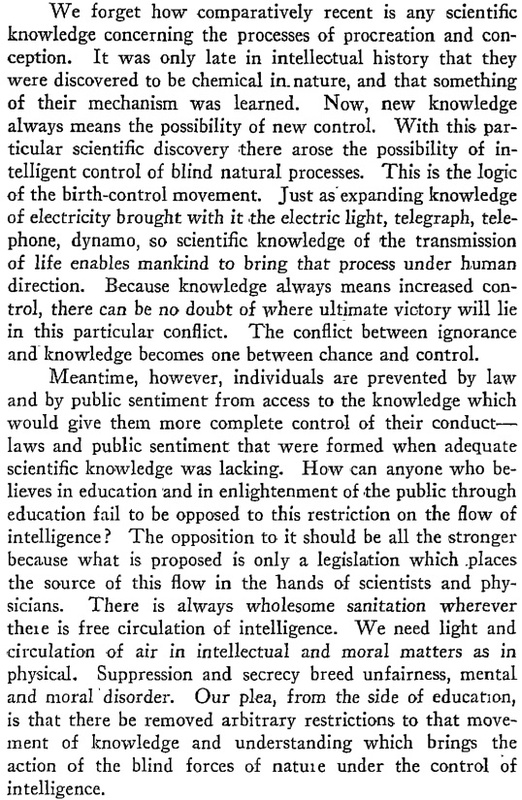 Rather worse, some of the early twentieth century’s birth control pioneers widely and willfully employed eugenicist language to argue for the proliferation of birth control among lesser human beings. 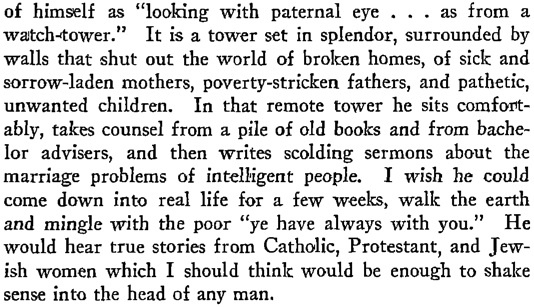 The Nation special issue from 1932 is loaded with such language. The most significant aspect…of birth control is as an indispensable instrument in the hands of modern, socially conscious man, to be used in the subjection of population growth to the same deliberate, rational, and farseeing manipulation that he prides himself on applying to every other great human interest. This is something quite apart from its utility in solving the problems of personal and family life. It is a phase of that broad, intelligent, scientific self-direction of human groups which can rightly be designated social engineering. The essay by Charlotte Perkins Gilman, best known by graduates of American high schools as the author of “The Yellow Wallpaper,” is surely the most cringe-inducing contribution to the special issue. Titled, not subtly, “Birth Control, Religion and the Unfit,” Gilman’s essay begins with an excoriation of “admitted defectives living on our taxes. They are not only passively injurious as not earning their own livings, but actively injurious as consuming the livings of useful people. We are mortified at our moronic average, alarmed at the increasing numbers of those far below it. Further, we find that the unfitter they are, the more lavishly they fulfill what some religionists assure us is the divine command—to increase and multiply and replenish the earth. Confronted with this difficulty, we propose to check the undesirable increase by the simple device of sterilizing the unfit. Unfortunately, when urging necessary legislation on the subject, we meet not only religious objections, but those of the unfit who are voters. On further thought, seeking to antedate the disadvantageous reproduction, we seize on the benefits of birth control, a practice which does not interfere with the pleasures of the unfit but saves society from their reduplication. Again we are met by the indifference of the unfit as voters, and mere ignorance and stupidity are likewise often backed by the enormous power of religion. 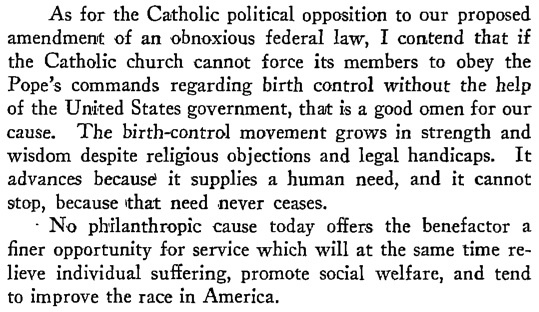 The suppression of information about birth control was ended by a Court of Appeals case in 1936. It was the beginning of a long line of victories for the emancipation of women and for reproductive rights. In the Hobby Lobby case and in its subsequent exemption of Wheaton College from the assurance of birth control coverage under the Affordable Care Act, a majority of Supreme Court justices have demonstrated their willingness to initiate a widespread rollback of those successes. History should inform our defensive strategy, as should a renewed and long-overdue debate about what progress really means.